This 17 inch side-to-side floor scrubber is operated by slightly lowering the handle to left, and the machine scrubs to the left. Then slowly dip the handle to the right, and it swings to the right. It is a swing machine that operates in a side-to side motion. 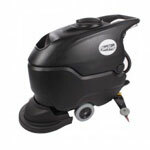 It can be used for scrubbing, stripping, and buffing hard floors as well as carpet bonnetting. Good for removing scuff marks in commercially finished tiled floors. Utilize the motion of the buffer to buff out deeply imbedded scuff marks and scratches. 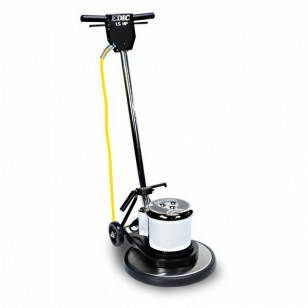 Looking for a floor scrubber in a different size? Take a look at our complete line of rotary floor buffer scrubber machines for other great options, if this machine does not meet your specific needs. Lifetime warranty on the stainless steel brush cover, and 5 years on parts & labor.